Harvard has a symbolic ring to it that thrills some and threatens others. When I was a graduate student at Princeton in the mid 1970s, people often commented on the large number of Harvard Ph.D.s on the faculty and lamented how some of them seemed to feel they were in exile teaching there. Both observations were undoubtedly a bit exaggerated. Exaggeration would be a polite way to characterize a recent statement by presidential candidate Mitt Romney - a rather curious statement from a truth-telling perspective. I refer to his strange statement in Harrisburg, PA, back in April, that President Obama spent too much time at Harvard - strange indeed since Romney actually spent more time at Harvard than Obama! President Obama attended Harvard from 1988 to 1991 and has one Harvard degree, a J.D. Candidate Romney attended Harvard from 1971 to 1975 - one year more than Obama - and has two Harvard degrees, a J.D. and an M.B.A. But does it really matter how many years a candidate spent there, or how many Harvard degress he actually acquired? Or is just his having been a student there the telling factor? What does matter is that this election is evidently a competion between two competing components of our reigning national elites - an "economic" elite, which has, especially in recent decades, become increasingly emboldened to pursue public power to advance its economic interests however much to the detriment of the common good, and a "cultural" elite, which combines some otherwise potentially laudable concerns for the common good (an admirable commitment to universal health care, for example) with an obsessive embrace of almost every morally problematic idea to have arisen in the last 50+ years. The likely prospect, therefore, whichever faction finally crosses the 270 electoral viote threshold, may be continued moral, cultural, social, and economic decline, while the world's climate keeps getting hotter and our hearts grow ever colder. In his intuitionist account of morality, The Righteous Mind: Why Good People Are Divided by Politics and Religion, published earlier this year, psychologist Jonathan Haidt notes that in the United States "people in the least religious fifth of the population give just 1.5 percent of their money to charity. People in the most religious fifth (based on church attendance, not belief) give a whopping 7 percent of their income to charity, and the majority of that giving is to religious organizations. It's the same story for volunteer work: religious people do far more than most secular folk, and the bulk of that work is done for, or at least through, their religious organizations" (p. 265). Such unsurprising findings seem to me to be also very relevant to the curent conflict between religious institutions in the U.S. and the current Administration in Washington. There are, of course, many different dimensions to this conflict. Likewise, there may be more than one explanation for how it came about - everything from a secular liberal ignorance about American religious life and the role of religious institutions in society to a secular liberal ideology that seeks deliberately to undermine American religious life and eliminate (or at least radically diminish) the role of non-governmental, especially religious institutions in American society. Explanations aside, however, it seems clear to me that one important dimension of this unfortunate conflict is the threat (whether intentional or unintentional) to the very vibrant network of "faith-based" institutions, through which so much not just charitable social service but so much building of social community occurs in this country (as confirmed by the above cited statistics). If one adopts the more conspiratorial view that this is all part of a deep-seated secular ideological drive to eliminate such "mediating structures" (as they have often been termed) from society and make government the only agent of social service and the only source of human community, then perhaps one sees the situation in its starkest terms - and sees the requirement to oppose such policies in its starkest urgency. But whether or not the initiating impulse is truly so intentional, the end result may be the same. What is increasingly at issue is to what extent the post-modern liberal state is able and willing to accomodate a society composed of communities and social networks that are neither creations of nor dependent upon the state. This is not about "Big Government" vs. "Small Government" - although it is in part at least about "Limited Government" (which is not the same as "Small Government"). As anyone familiar with my personal views knows, my political orientation tends toward the Hamiltonian. I favor a strong national State and an activist government - albeit one whose ultimate power is limited by its recognition of the necessary role of non-governmental society and especially of religious institutions in society. Apart from from the inherently and ultimately supernatural nature and purposes of religion, it seems evident that religion motivates and facilitates the creation and survival of human communities in a way no purely secular force has ever been able to do, and that society (and the State) benefit significantly from the social role of religious communities instituions. As yet another example of the greater communitarian force of relgiiopus motivation, Haidt also cited Richard Sosis' study of the fate of some 200 "communes" founded in the U.S. in the 19th-century. Twenty years after their creation, Sosis' study found that just 6% of the communes organized around secular principles were still functioning - as opposed to 39% of communes organized around religious principles (cf. Haidt, p. 256-257). So, in addition to all the religious, political, and legal issues that are in play in this current controversy, we also as a nation need to be asking ourselves whether we really want a society, which is actually not a society at all but just an arm of government, one in which we depend almost exclusively on government for almost everything important. Or do we want to value and preserve a society with a vibrant life of its own, based on religious communities and social networks which base themselves on something other than (and more) than the power of the State. Last week, Fr. Jerry and I were in New York for the ordination of 3 new Paulist priests. The central act of the ordination rite is the ancient ritual of the “laying on of hands.” In total silence, the Bishop lays his hands on the head of each one to be ordained. Then the other priests present join in and also lay their hands one by one on those to be ordained. The laying on of hands” is an ancient gesture. We find it in the Acts of the Apostles, and in his 2nd letter to Timothy [2 Timothy 1:6] St. Paul refers to his having himself done it to Timothy. It is done globally to the whole group at Confirmation, and it occurs in every Mass at the Eucharistic Prayer. It is a symbolic gesture, which signifies the Church’s prayer for the Holy Spirit to come down upon those being confirmed or ordained or at Mass on the bread and wine to be consecrated. It is a very solemn and powerful gesture, the importance and significance of which is inherently evident, just from seeing it. That is how the presence and power of the Holy Spirit are ritualized in the Church’s sacraments. But at the very beginning of the Church, the presence and power of the Holy Spirit were even more dramatically on display, when suddenly there came from the sky a noise like a strong driving wind and there appeared to them tongues as of fire, which parted and came to rest on each one of them. And the 120 disciples gathered in that Jerusalem Upper Room were all filled with the Holy Spirit and began to speak in different tongues, as the Spirit enabled them to proclaim [Cf. Acts 2:1-11]. Many people, if they think about the Holy Spirit at all, often picture him as some sort of bird. A strong driving wind and tongues of fire may be a bit more exciting, but may still seem somewhat elusive as an image of who the Holy Spirit is. God, of course, is, by definition, difficult to describe. Who the Holy Spirit is may be hard to pin down, but what he does is another story. What he does at Pentecost is kick-start the mission of the Church by getting it out of that Upper Room! Next month, Queen Elizabeth II will celebrate her 60th year on the British and various other Commonwealth thrones. Back when her Great-Great-Grandmother, Queen Victoria, celebrated that same milestone in 1897, she was too frail to walk down the long aisle of London’s St. Paul’s Cathedral. So the Thanksgiving Service was held outside, in front of the cathedral. That prompted a scowling comment from the Grand Duchess Augusta Caroline of Meckenburg-Strelitz, who complained about the Gospel being proclaimed out in the street – apparently forgetting (or ignoring) the fact that the street was where the Gospel had first been proclaimed! And just who was there to tell out in the street? In Jerusalem that Pentecost were devout Jews from every nation under heaven. So the second thing the Holy Spirit did was to breakdown barriers, beginning with the basic barrier of language. When the apostles spoke, each one heard them speaking in his own language. To those who knew their Bible, the meaning was clear. The Holy Spirit was undoing the evil of multiple languages in the world, the damaging diversity of languages that had come about as a result of human beings’ sinful attempt to construct a tower to get them to heaven on their own [cf. Genesis 11:1-9].. Through the presence and power of the Holy Spirit, however, the Church undoes the disunity of the human race, reuniting it in something new, the kingdom of God. Artistic renditions of that first Pentecost frequently focus on the 12, typically depicted as grouped in a circle around Mary, the Mother of the Church. In a famous mosaic in the Cathedral of San Marco in Venice, however, each of the 16 nationalities that are mentioned in the story is represented by a pair of figures, thus representing the universality of the Church. The point of the Pentecost story is not society’s diversity, which is just a human fact, but the Church’s unity and universality, which are among the accomplishments of the Holy Spirit. Both before and after the Tower of Babel, of course, the damage done by human sinfulness has taken many destructive forms. In his letter to the Galatians [5:16-25], St. Paul listed at least 15 of them. Too many Christians sometimes seem to have gotten into the habit of singling out this or that vice for special opprobrium – as if, for example, the only sins that matter were the sins against the 6th commandment, as if idolatry, sorcery, hatreds, rivalry, jealousy, fury, selfishness, dissensions, factions, envy, etc., weren’t just as important. Paul’s list is a long one, and we need to take it all to heart. Thanks, however, to the presence and power of the Holy Spirit in the Church, there is another list. Thanks to the presence and power of the Holy Spirit in the Church, the damage can be undone – in the lives of those guided by the Spirit, who live in the Spirit, and who follow the Spirit. In a world, which still seems to resemble the Tower of Babel more than the Kingdom of God, the presence and power of the Holy Spirit are also evident in the fruit of the Spirit – in love, joy, peace, patience, kindness, generosity, faithfulness, gentleness, and self-control. We need no precise picture of who the Holy Spirit is, when we witness what he does, when we witness – and live – the fruit of the Spirit. 50 Days have passed since we gathered here to celebrate the Lord’s resurrection. And, during the course of the Easter season, there has been a certain shift in emphasis from what Jesus himself does to what his disciples will do – more precisely to what the risen and ascended Christ continues to do in the Church through the Holy Spirit who has been given to his disciples so that they can continue his work in the world. It takes time, of course, to prepare people properly to undertake something so major. In a sense, that is what the risen Jesus was doing during those six weeks which followed his resurrection and ended with his ascension 40 days later. Jesus was laying out his program and preparing his disciples to implement it. And now the implementation process is set to begin. Jesus’ program, of course, is the mission of the Church. For the Church is what Pentecost is about – the Church which has been entrusted by the risen and ascended Lord to continue his life and mission on earth by bringing the good news to all. What we call Pentecost is actually a very ancient festival. The Greek word “Pentecost” refers to the 50th day - originally the 50th day after Passover. Its Hebrew name, Shavuot, means “weeks,” referring to the seven weeks that began with Passover. Shavuot was the second of the three great pilgrimage feasts in the Jewish calendar – along with the spring feast of Pesach (Passover) and the autumn harvest festival of Sukkot (which the New Testament typically calls “the Feast of the Tabernacles”). Originally a joyful thanksgiving feast for the early spring’s harvest, over time it became a commemoration of the covenant, of the giving of the Torah at Mount Sinai, which occurred (according to the account in Exodus) at about seven weeks after Israel’s escape from Egypt. Just as summer fulfills the promise of spring, the giving of the commandments fulfilled the promise of nationhood, of which the exodus had been but the beginning. So too, Pentecost’s gift of the Holy Spirit fulfilled the promise of the resurrection, transforming the disciples into faith-filled witnesses testifying to the whole world. The second thing the Holy Spirit did at Pentecost was to break down barriers, beginning with the basic barrier of language. 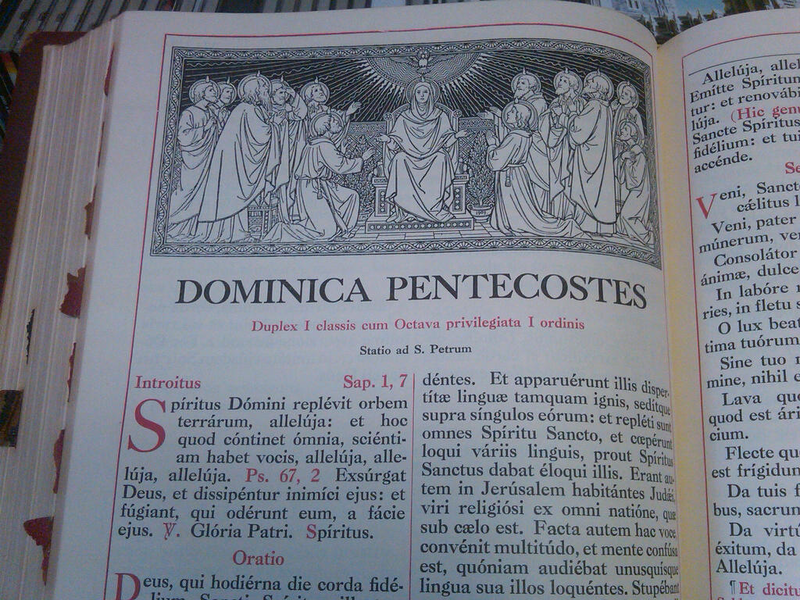 When the apostles spoke, each one heard them speaking in his own language [cf. Acts 2:1-11]. To those who knew their Bible, the meaning was clear. The Holy Spirit was undoing the evil of multiple languages in the world, the damaging diversity of languages that had come about as a result of human beings’ sinful attempt to construct a tower to get them to heaven on their own [cf. Genesis 11:1-9]. Through the presence and power of the Holy Spirit, however, the Church undoes the disunity of the human race, reuniting it in something new, the kingdom of God. The point of the Pentecost story is not society’s diversity, which is just a human fact, but the Church’s unity and universality, which are among the accomplishments of the Holy Spirit. Both before and after the Tower of Babel, of course, the damage done by human sinfulness has taken many destructive forms. Thanks, however, to the presence and power of the Holy Spirit in the Church, the damage can be undone – in the lives of those guided by the Spirit, who live in the Spirit, and who follow the Spirit [cf. Galatians 5:16-25]. In a world, which still seems to resemble the Tower of Babel more than the Kingdom of God, the presence and power of the Holy Spirit are also evident in what we call the fruits of the Holy Spirit – in love, joy, peace, patience, kindness, generosity, faithfulness, gentleness, and self-control. 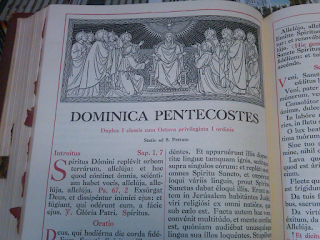 Liturgically, Pentecost marks the transition from Easter to ordinary Time – from spring to summer. It’s our annual observance of what happens every week with the transition for Sunday to Monday. From this, our common celebration every Sunday around the altar of the unleavened bread of Easter, where we are made one body through the power of the Holy Spirit, from this the Holy spirit’s energy calls us forth to a new concern for the entire human family and all that affects it. From here on Sunday, the gift of the Holy Spirit challenges us on Monday to bring the presence and power of the Risen Christ out into the ordinary, leavened bread which is our (no-longer) ordinary life in the world. Recently, I received an email pointing me to "an incredible ad by the Catholic Church." Curious I went to the link and found a political ad produced by some group, the members of which may indeed by Catholics, but who are not - and therefore do not speak as or for - "The Catholic Church." Of course, Catholics are citizens and have every right to express their political preferences. And, if they base those political preferences on their Catholic beliefs - or on some historic Catholic identity - then they also have every right to say that. For example, Congressman Paul Ryan recently alleged that his policy proposals were inspired by his Catholic faith. In resposne, some others, who also identify as Catholics, took issue with his interpretation of the faith. That's all well and good. But it becomes a problem when the political preferences of this or that Catholic or group of Catholics are automatically identified with "The Catholic Church" - as if the Church were a primarily political institution (or perhaps some sort of PAC), as if one would expect the Church as a normal practice to participate in the political process. I empahsize "as a normal practice," because obviously crises can and do occur in human affairs when the Church's direct involvement in politics cannot be avoided. Overt persecution is one obvious example. The soon to be released film about the Mexican Cristeros and their resistance against the Mexico's revolutionary government may be a timely reminder of the ever-present possiblity of persecution and of the reality of authentic martyrdom in our modern world. Operating through the peaceful and legal channels of a democratic society, the American Catholic hierarchy's longstanding opposition to judicially created abortion "rights" and their active support for measures (e.g. the "Hyde Amendment") which, while inevitably limited in effect, actually accomplished something beneficial in terms of making aboriton less accessible are certainly sound examples of direct Church involvement that is both necessary and appropriate. (And surely the persistence of Catholics and other Christians in keeping this issue in the political arena has contributed in some degree to the changing climate of opinion in our society in which younger people are increasingly more pro-life). The current conflict regarding religious liberty, unnecessarily and gratuitously provoked by the government, likewise certainly requires a robust public response, not just by Catholics but by all Churches concerned for their freedom to prusue their mission in society. In recent decades, however, there seems to have been a subtle change in the role of religion in American society. We have always been a religious country, and religion has always played a part in public life. But the increasingly remarked upon relationship between religious observance and political partisanship is new - or at least certainly much more intense than in the past. This is reflected in the transformation of the political parties themselves, which have increasingly defined their differences from each other in terms of cultural and moral fault lines. (It was just 32 years ago, after all, in 1980, that the Democratic Party first identified itself in its party platform as "pro-choice," and the Republican Party in its platform for the first time endorsed an anti-abortion constitutional amendment). Political parties used to be bread-based coalitions with members all over the place politically. As parties have narrowed, so seemingly has religion. My sense is that people who care deeply about moral and cultural issues have gotten so used to voting one way or the other, for one party or the other, that they have increasingly bought into each party's narrowed political, social, and economic agenda. There is, for example, no obvious link whatever between being pro-life and wanting lower taxes or smaller government. If, however, a polarized political process makes all those things inseparably part of a single package, then perhaps over time people will tend to accept the whole package as their own set of political values. As partisanship has become more religious, it seems that some Americans may actually be making religious choices based on their politics, that politics actually drives some people's choice of their religion. (On this, see, for example, Putnam and Campbell, American Grace: How Relgiion Unites and Divides Us, 2010). I is uncertain where all of this is eventually leading us. But it seems prudent to worry whether religion can count on being the ultimate beneficiary of such progressive politicization. I've always liked following politics and, while I no longer care about politics as much as I once did and certainly don't invest it with any transcendent significance, I still probably care more about politics than the typical citizen and still probably pay more attention to it than most ordinary folks. So it was almost inevitable that at some point I would want to watch Veep, the new series on HBO set int he office of a fictional Vice President of the United States, former U.S. Senator Selina Meyer. The series premiered in late April, and I now faithfully record each Sunday evening's sorry episode. And, because I do like the human story of politics, I admit I enjoy the program - up to a point. Inevitably, Veep invites comparison with the Clinton-era series West Wing, which starred Martin Sheen as an admirable, if flawed, President. West Wing was as much about the president's staff as about the president, if not more so; and I always thought there was some artificiality in isolating that slice of the Washington political scene. Still, it was a good series. Its first season - when the characters still seemed to have real personal lives - was probably the best. Veep's creators might or might not appreciate the comparison with West Wing. There really is very little comparison in terms of quality. Or, rather, Veep is to West Wing as the Vice Presidency is to the Presidency. And we all remember what John Adams, the first occupant of the office, rightly said about the Vice Presidency, that it was "the most insignificant office that ever the invention of man contrived or his imagination conceived." Given the limitations inherent in the Vice Presidential office itself, perhaps it is only to be expected that a TV drama about it (however entertaining) must be disappointing in substance. That said, still the series disappoints at a deeper level. For one thing, the characters are not just flawed (as all people are) and not just excessively, even narcissistically ambitious (as politicians are prone to be), they are downright dumb - so apparently incompetent and so self-preoccupied that it is hard to see how they even got as far as they did. Admittedly, good looks and an attractive personality may count disproportionately more than either intelligence or principle in electoral politics. Still, most people who advance as far as the characters portrayed in the program generally have more to recommend them. Ironically, the one person who best fits the stereotype of the good-looking, cunningly ambitious aide is also the one who comes across as the most highly competent staff member in the Vice Presidential office - Dan Egan, the Vice President's Deputy Director of Communications (played by actor Reid Scott). They are also vulgar - to the point of absurdity. Again, thanks to the widespread coarsening of our culture in general (and Cable TV in particular), we have all gotten used to characters who seem unable to utter a sentence without one widely overused vulgar word. Admittedly, too, prominent people do talk that way sometimes - although typically in private. Still, there is something very demeaning to the characters and disappointing about the roles they represent to hear the Vice President of the united States, U.S. Senators, and political staffers all sounding like adolescents and obviously unable to converse any other way! Entertaining and funny up to a point, the program sadly reinforces a narrative about politics and politicians which is all too prevalent in a society which has always been ambivalent about both politics and politicians. When we think of our office-holders and those they rely upon as at best, vulgar, venal ,and self-serving and at worst unintelligent and incompetent, it reinforces and encourages a pseudo-populist mentality about politics and politicians - a mentality which also conveniently ignores the voter's ultimate responsibility for rewarding such behavior. The results of such a mentality - the results of its prevalence in our society today - are on display in the corrosively destructive non-politics promoted, for example, by such phenomena as the Tea Party and the Occupy Movement. It’s always wonderful to be back here at St. Paul’s - especially on a day like today, since it means I get to celebrate the Ascension on its actual traditional day, festively observed as only New Yorkers know how to do by suspending alternate-side-of-the street parking! It’s even better, of course, in some European countries where it is still a legal holiday. In some of them the Stock Markets are closed in observance of the Ascension, which - in Europe right now - might be a persuasive argument for even more such holidays! As the words of the Creed suggest, the ascension actually involves several things. Historically speaking, it has to do with the fact that the Risen Christ was no longer living among his disciples as he had been before. The Risen Lord lives already the new life of the future of which his resurrection is a kind of foretaste for us. According to the New Testament accounts, the Risen Jesus appeared a number of times to his disciples. But then, after a certain limited period, those appearances ended. It was time to move on to the next stage in history – our time, the time of the Church. Historically, therefore, the Ascension refers to the end of that period of the Risen Christ’s appearances to his disciples and the beginning of the time of the Church. That being the case, one might ask: well, where exactly is he? Again, the Creed contains the answer: he is seated at the right hand of the Father. Of course, as Son of God, the Divine Word, has always been with the Father. Theologically speaking, what the Ascension celebrates is that God-with-us, the Word-made-flesh, the incarnate Christ is now with God his Father, the fact that his human body (and thus our shared human nature) that is with God. In Jerusalem, in the Church of the Ascension on the Mount of Olives, pilgrims get to see a footprint-like depression in the rock, which purports to be the exact spot from which the Risen Lord ascended to heaven – a bit fanciful, perhaps, “as if” (as one author has written) Jesus “sprang into the heavens with such vigour that the very rock underneath his feet was compressed in the act” [Douglas Farrow, Ascension Theology, 2011]. The footprint may well be fanciful, but it does highlight the fact that it was Jesus’ human body (and thus our shared human nature) that ascended – that is, is now with God. As St. Augustine famously said in one of his sermons: “Although he descended without a body, he ascended with a body and with us, who are destined to ascend, not by reason of our own virtue but on account of our oneness with him” (Sermon 263). Thus, the Ascension anticipates what the resurrection has made it possible for us all to hope for. In the words of today's liturgy: he ascended, not to distance himself from our lowly state, but that we might be confident of following where he has gone before. Meanwhile now - in this interim between the Ascension and the end - the Church continues his life and work on earth. They went forth everywhere, while the Lord worked with them and confirmed the word with accompanying signs [Mark 16:20]. 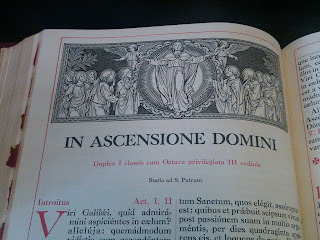 Homily for the Solemnity of the Ascension, Church of St. Paul the Apostle, NY, NY, May 17, 2012. Having been born in 1948, I am perhaps particularly partial to people and events connected with that year. Many noteworthy baby-boomers (all obviously much more noteworthy than I) were born 1948 - including actors Anthony Andrews, Jeremy Irons, John Ritter, and Jerry Mathers (Leave It To Beaver), composer Andrew Lloyd Weber, pollster John Zogby, David Eisenhower, Bryant Gumbel, and His Royal Highness The Prince of Wales. Also in 1948 the Berlin Airlift began, and Harry Truman won an upset victory over "the little man on the wedding cake," Alice Roosevelt's derisive label for Republican New York Governor and two-time presidential loser, Thomas Dewey. Of course, some scoundrels were born and some bad things also happened in 1948. But these were some of the more wonderful ones. Among all the many wonderful things that happened in 1948, one of the most amazing was the restoration on May 14 of an independent Jewish State after two millennia of Jewish exile from the land that was so central to God's covenant with Abraham and his descendants. After all that the Jewish People had experienced, modern Israel's mid-20th-century rebirth may have seemed at the time almost miraculous. It was, in fact, the result of much effort and struggle - by pioneering settlers struggling to make a new life in a precarious environment, and by heroic soldiers, whose new nation was immediately invaded by hostile Arab armies. Israel survived its War of Independence and then three other major wars in 1956, 1967, and 1973, but its survival remains an ongoing struggle against implacable foes. As it says in the traditional Passover ritual: In every generation they stand up against us to destroy us, and the Holy One, blessed be He, saves us from their hand. Regrettably, it took until 1994 for the Holy See to recognize Israel and establish proper diplomatic relations. Ninety years earlier in 1904, the founding-father of the Zionist Movement, Theodore Herzl, had had an audience with Pope Pius X, at which the Pope famously told Herzl that, the Church "cannot prevent the Jews from going to Jerusalem, but we could never sanction it." The theological basis for this was probably not any person ill-will on the part of the saintly Pius X, but merely the more or less traditional Christian interpretation of the 1st-century destruction of the Jerusalem Temple and subsequent history. A new, more promising path was opened for Christian thinking about contemporary Judaism, however, when the Second Vatican Council endorsed St. Paul's view that the gifts and call of God are irrevocable (Romans 11:28). Even then it took another three decades to translate that principle into action at the diplomatic level. That this finally happened was undoubtedly due to the persistence of Blessed John Paul II, who did so much to repair the relationship between Christians and Jews. Coming of age in New York and studying at City College, I had acquaintances and friends for whom growing up included some personal experience in Israel. Much later on, one of my most spiritually enriching experiences would be the summer I spent in Israel in 1993. the Jewish Promised Land and the Christian Holy land intersected and reinforced one another for me and made so much more vivid our common connection in sacred stories and eternal hopes. Every day during the Easter season, the 1st reading at Mass is taken from the Acts of the Apostles – the 2nd volume, so to speak, of the Gospel according to Luke – the story of what happened next, the sequel to Jesus’ resurrection and ascension. It’s the wonderful story of how a mere 120 disciples were transformed by the Risen Christ’s parting gift of the Holy Spirit into a missionary movement that spread from Jerusalem to Rome and in the process was transformed from a small Jewish sect into a world-wide Church with a universal mission. To us, who already know the story, that all seems to have been so obvious and inevitable. For the first Christians, however, it must have seemed like one new learning experience after another. Today’s 1st reading [Acts 10: 25-26, 34-35, 44-48] recounts one pivotal point in that process. The story actually began earlier with Peter, the leader of the Christian community, making what we today might call a “pastoral visit” to the disciples in a town called Joppa (near today’s Tel Aviv). While there, Peter had a dream, in which he saw various animals, not all of them kosher, and heard a heavenly voice tell him to kill and eat them. When Peter responded that he had never eaten non-kosher meat, he was told, What God has made clean, you are not to call profane. That’s a good example of something the meaning of which, to us in retrospect, seems so obvious, but which at the time, in its actual context, must have seemed so perplexing. While Peter pondered this perplexing dream, however, emissaries from a Roman centurion, named Cornelius, came calling and asked Peter to accompany them back to Caesarea, which Peter promptly did. And that is where today’s reading picks up the story. Thus began the momentous change that enabled Christianity to spread and take root throughout the world, becoming eventually the largest religion in the world and the largest growing religion in the world today. I say “began,” because, of course, the full implications of something so unexpected took time to sink in. There were many Gentiles sympathetic to Judaism at the time. Some even went all the way and converted. Had Cornelius converted and become a Jew and then acknowledged Jesus as the Messiah, he would not have been all that different from the other early Christians, who were, of course, also Jews who acknowledged Jesus as the promised Messiah. Cornelius, however, had not become a Jew. He had “jumped the line,” so to speak, directly into Christianity. Soon the Church would have to debate whether Gentiles needed to become Jews first in order to become Christians, and Peter would cite this transformational event as the key to understanding God’s will for this Church – that it be the vehicle for conversion and repentance for all, without exception and without restriction. This was not like some modern or post-modern dismissal of parts of the Bible that the apostles suddenly found inconvenient, but rather a recognition of how God’s covenant with Israel was being fulfilled in Christ. It was God who took the initiative in all this – directing Cornelius to invite Peter, prepping Peter with his dream, and then dramatically demonstrating God’s plan to include the Gentiles by giving them the Holy Spirit. For his part, Peter, as leader of the Church, recognized God’s action and accepted its implications, baptizing the first Gentile Christians and incorporating them into the community. Precisely as Christ’s Church, we are challenged at every level to expand our horizon, just as the apostolic Church had its horizon expanded, to understand our own local experience of Church as one with that of the young, emerging Church in Africa, the aging Church in Europe, and the even more ancient Churches in India and the Middle East, to understand how our own middle-aged American Church is being rejuvenated and revitalized by many new immigrants, to understand our own local experience of Church in the wider terms of God’s great plan for the salvation of the world – God who sent his only Son into the world so that we might have life through him [1 John 4:9]. Homily for the 6th Sunday of Easter, Immaculate Conception Church, Knoxville, TN, May 13, 2012. Just when it seemd as if American politics could hardly get more pathetic, along comes the latest story about something Mitt Romney allegedly did - almost 50 years ago! in High School! Now I have no interest in defending Mitt Romney from anything. Given the absurd stuff he and his supporters have been peddling about the President, perhaps his campaign deserves to be on the defensive about more than just how he has treated the family dog! Even so, with all that whoever is sworn in as President of the United States at noon on January 20 will have to deal with, is this really what we need to be talking about? The narrative being promoted by this story is, of course, that Romney is a privileged snob and a bully. It's a fair enough accusation - assuming it is based on his adult actions. And there exists a record of his adult actions - in business, at Bain Capital, for example, and in politics, as Massachusetts Governor and as a political candidate off and on since he ran against Ted Kennedy back in 1994. There is plenty there to judge the man on. No one should need to dredge up teenage behavior (or misbehavior) to confirm - or contradict - a candidate's public record as an adult. I didn't attend a fancy prep school myself, but I did endure High School in the early 1960s. I survived, obviously. But it is not an experience I would want to repeat - or recommend to anyone else. Not that my particular High School was all that particularly bad. It had its really horrible moments. But, on balance, the overall experience was tolerable and even had its occasional happy moments. Best of all, I formed one good High School friendship that has lasted to this day. Given who we were at the time and what the world was like then, it was probably as good as it was going to be. That said, High School is something basically to be endured until one can move on with one's life. I'm too far from the contemporary High School experience to compare, but my guess is that, on balance, being a High School students may be even more stressful today than it was then. In any cae, those who survive High School and succeed in life (however one defines success), do just that. They move on. They become adults. And it is as adults that they should be judged. (In 2005, I attended my 40th High School reunion - the only such reunion my class has ever had. I went in part to see people most of whom I had not seen in 40 years, expecting to meet not 1960s teenagers but the adults they had become - and trusting that they would accept me in turn as the adult I had become). When I was in High School, bullying was just taken for granted as normal part of adolescent life. Those of us who were not privileged may have wished it were otherwise, but but that was the way it was. One could say something similar about homophobia, except for the critical fact that homophobia hadn't yet been invented as an issue. The psychologist George Weinberg is generally thought to have invented the word in 1969, and he certainly employed the term in his subsequent book Society and the Healthy Homosexual (1972). As I recall, the word really became common only in the 1980s. In any case, the concept - and certainly any significant social disapproval of the attitudes and behaviors it describes - none of that was part of the picture in the early 1960s, when the word "gay" could still be used (and routinely was) in its orginal, non-sexual meaning. As for homosexuality, it was generally thought of (when people thought about it at all) as a sin - or, in more enlightened and liberal circles, as a sickness for which some psychiatric therapy might be helpful. To expect Mitt Romeny as a 1960s teenager to have been able to see into the future and understand that decades later as an adult he would be expected to adopt a different views on the subject of homosexuality is as ridiculous as to fault Barak Obama, as a boy in Indonesia, for having eaten dogmeat because decades later some might make an issue of it! Who these two men have become, the way they have opted to live their adult lives, the personal and political choices they have made, and the policies they advocate - that is what this election ought to be about. Among the anomalies we had occasion to learn about in my Roman Studium at the Congregation for the Causes of Saints this past winter was the curious case of the influential German medieval mystic and moastic foundress Hildegard of Bingen (1098-1179). Her reputation for sanctity was already widely noted during her life, and after her death a number of miracles were attributed to her intercession. Accordingly, in 1228, responding to the request of Hildegard's Rupertsberg convent, a local process was initiated in Germany, the acts of which were duly sent under seal to Rome in 1233. This was right at the period when the canonization process was becoming centeralized in Rome. In 1179 Pope Alexander III had written a pastoral letter to the King of Sweden, towards the end of which he reprimanded the Swedes for venerating as a martyr a man who had been killed while intoxicated. Even if there were miracles attributed to the person, the Pope insisted, it was not permissable to venerate someone as a saint without Roman authorization. This paragraph, known forever after by its opening word Audivimus ("We have heard"), was inserted by the Dominican canonist St. Raymond of Penyafort (1175-1275) into the Decretals promulgated by Pope Gregory IX in 1234. Gregory IX was supportive of Hildegard's cause, but the local proces had been - to put it politely -poorly performed. Egregiously, the names of the witnesses were missing from the documentation sent to Rome, and so the depositions were deemed insufficient. The Pope sought unsuccessfully for the necessary information. So did Innocent IV in 1243 and John XXII in 1317. By then, however, the lack of any first-hand witnesses had rendered the whole process much more problematic. The curious result was that Hildegard - although widely thought of and even referred to as a "saint" (especially in her native Germany) - was never in fact formally canonized. Apparently unaware of this, the Bishops of her native Germany in 1978 petitioned the Holy See to declare her a Doctor of the Church! (She did make it into Outer Space, however, where an asteroid is named after her - asteroid898Hildegard). Yesterday, Pope Benedict XVI, who has already devoted two of his General Audience talks to her, finally fixed this unfortunate state of affairs and formally inscribed her name in the Church's roster of canonized saints. May this long-delayed honor to St. Hildegard be a blessing to the Church - as well as a timely reminder of the importance of keeping accurate paper work and doing one's job seriously and well! I haven't the slightest idea whether as President of France M. Hollande will actually be an improvement over the somewhat idiosyncratic (by French standards) M. Sarkozy. Only time will tell - both for France itself and for France's neighbors, yoked together in their dubious European Union. When given the chance, Europe's voters have often evidenced prudent skepticism about the EU project that in recent decades has been foisted upon them by their elites - the same elites whose economic ideology voters are also apparently rejecting. Such is the dominant cultural elite's difficulty with deomocracy that this has been the subject of some general hand-wringing. I even read somewhere the worry that France's soon-to-be President may genuinely believe in "a fairer society." That may be an unattainable goal under the circumstances, and he may perhaps emply unsuitable means to try to get there, but surely there must be worse things for a putative politicla leader to be accused of! Talking to a European acquaintance earlier int he Greek crisis, I repeated the common (and self-evident) observation that the Euro common currency had made a bad situation significantly worse, since Greece could no longer devalue its own currency. My friend more or less agreed that the Eu had created a mess, but then added the non sequitur that the EU had been "the moral thing to do." Being long acquainted with elite ideologies, I was not as flabbergasted (as one perhaps should be) by such a complete non sequitur, but that resposne remains surely highly problematic in any event. How does one answer the defense of something like the Eu - defended not for any real good it may have accomplished - but for being more "moral"? Morality in this case seems to be a thoroughly rational abstrtaction from real life - as if the negative consequences of a policy were irrelevant to its "morality"! Oh, well, let's hope the election of a new President in France, the recent collapse of the coalition government in the Netherlands, and the latest government collapse in Greece spur Europe's leaders to adopt some sensible policies - even at the risk of their being "fairer" - even if that puts the Euro (or indeed the whole EU project) at risk. Although thoroughly rooted in ancient, pre-Christian paganism, "May Day" acquired a whole new identity in the 19th century as various labor movements (and eventually the Communist Party) made May 1 a day of socialist solidarity. In an attempt to co-opt this communist and socialist celebration, Pope Pius XII in 1955 proclaimed May 1 as the feast of St. Joseph the Worker, belatedly giving May Day a Christian, Catholic character. Barely 14 years later, however, the 1969 calendar reform downgraded the one-time 1st class feast to a merely optional memorial! Even so, I celebrated St. Joseph the Worker with suitable solemnity this morning at our local St. Joseph School. (With the subsequent collapse of communism, followed by globalization's disastrous impact on organized labor, the modern May Day of workers’ solidarity is itself likely much diminished - even if, like our American Labor Day in September, it still remains a holiday in many countries). Celebrating St, Joseph the Worker at Mass this morning, I was quite taken by how the Collect of the Mass addresses God as the Creator "who laid down for the human race the law of work." After two millennia of Christianity, it may be easy for us to forget how new was the view of work, which Christianity introduced into the classical world. In Book VII of his Politics, Aristotle famously insisted that citizens could not be mechanics or shopkeepers, lives he considered ignoble and inimical to goodness; nor could they be farmers. For Aristotle (and the classical world his philosophy summarized) leisure was necessary for both goodness and political activity (Politics, VII, ix, 1328b-1329a). The ancient democratic polis presupposed a population of free non-citizens (and un-free slaves) whose work would produce the surplus necessary to make possible the higher culture and political activity of the citizens. Obviously work was necessary and important, but it was leisure which was valued. Contrast that with the completely different environment one finds, for example, in St. Benedict's Rule, according to which true monks (the monastic equivalent of citizens) live by manual labor - like the apostles before them. Again, while work was necessary, it was not the point or purpose of monastic life, which was prayer and contemplation. Unlike the polis, however, the monaastary expected its citizens to do the necessary work themselves and accorded a moral value to labor which the classical pre-Christian world never did or could. In the modern world, the labor movement, besides advancing the material interests and economic well-being of workers also restored moral and social value to the world of work retrieving what had seemingly been lost in the alienating experience of industrialization. In the United States and in Western Europe, one result was the rise of the most propserous working class in human history - a new "middle class" anchor for civil society and democratic nation-states. Now, all that is imperilled again, as once again those who live by work seem squeezed by economic forces and their way of life appears to be losing that "middle class" character. The increasing inequality in our society separates the economic elite from the laboring classes not just economically but (as in antiquity) culturally. A half-century ago, my father's boss was certainly richer than my father and accordingly had greater access to a greater amount of luxury. But the gap between their incomes was nothing like what we see today. And, just as important, neither was there the cultural gulf that now exists. My guess is that my fatrher's boss and the "blue-collar" employees his company hired had more in common culturally and morally than separated them. Their values, their overall outlook on what life was about and what mattered most were much more similar than is experienced today. And, in that, lies one of our greatest challenges and one of the greatest obstacles to reparing our fractured society.